A 90-minute concert, filmed live in Lyon, France, in the summer of 2001, in support of his then-latest solo record, No More Shall We Part. God is in the House finds Nick Cave and the Bad Seeds delivering a mature, thoughtful performance that surrounds their more textural and atmospheric side than their rock side. However, this is a good thing, as Cave and company demonstrate in this live performance, whipping out beautifully crafted, smart, intelligent (and, slightly eerie), songs that have made him the songwriting phenomenon we all know and respect him as. Also including a documentary entitled No More Shall We Part: The Recording Sessions, which gives you a look into Cave's creative process and their recording preferences, as they record at London's famed Abbey Road Studio. Another bonus feature is three videos for tracks off of No More Shall We Part, a treat for American audiences who, most likely, unless you're a die-hard fan, haven't seen them before. It's not like MTV would ever play them. 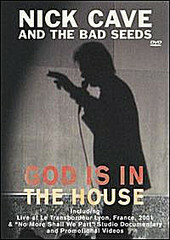 Well filmed, beautifully edited, and excellent sound quality make this a nice package, the perfect DVD for the Nick Cave and the Bad Seeds fan in you. I'll give it an A.